Kid Nepro and Korg synthesizers go back to 1984, when we released our first set of sounds for the original Poly 800 synthesizer. Over the past thirty years, we have created thousands of sounds for over twenty five Korg synths. So, when Korg released Krome (their newest workstation), it was only natural that we continue doing what we do best – make new sounds for it. The Krome synth engine is similar the Korg’s Kronos HD-1 engine, which we know very well. 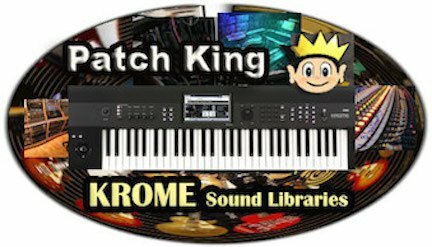 That made it easy to get up to speed with Krome and start programming new sounds right away. With a little help from our friends at Korg, we immediately imported 32 MB of our best analog synth samples into Krome and went to work creating new programs and combis from the new samples. The result is our first release for Krome – Vintage Synths. In addition to the 32 MB of new samples, Krome Vintage Synths features 64 programs and 16 combis ($49. USD). All programs and combis include drum track and arpeggio function (so you can easily jam along), as well as control assignments to Krome’s joystick, user knobs and switches. The result is the best analog sounds with the best modern controls that will inspire you to do what you do best – create cool new music. Kid Nepro’s Krome sounds are delivered via our download delivery only. After you order, we e-mail you all the info needed to download your new sounds. Just download the sounds and save the files to your smart media card, insert the card into Krome and load. It’s quick, simple and best of all, no shipping charges! Pick the PCG format and the free e-mail delivery options at our online order form. If you need any more info just E-Mail Us and we will be happy to help get you going. Our customer support rules. When we get our hands on a new synth, we spend a lot time with it in order to create the finest new sounds possible. It can take a year or longer to complete a sound library for today’s modern workstation’s. So, we just wanted to let everyone know that we will be continuing our support for Korg’s next generation workstation and we will be creating several new sound libraries for Krome over the next year. Get on our mailing list and we will keep you posted with more details on what’s coming for Krome. It’s going to be awesome! Click here for more info and demos.